Earthtec Projects was established over 10 years ago. We have broad expertise and the right equipment for Excavation, Drainage, Civil Engineering contracting, Crane Operations and Rock Crushing/Breaking. Our team includes experienced digger operators, crane operators and dogmen , estimators and site works operators. Above all else Earthtec has all of the equipment ready to help you in any construction project, large or small. Our fleet of diggers, drainage equipment, trucks, cranes, rock crushers/breakers and levelers are available to tackle any project. Most importantly we stand by our work, and take pride in seeing large projects take shape using our team and our equipment. 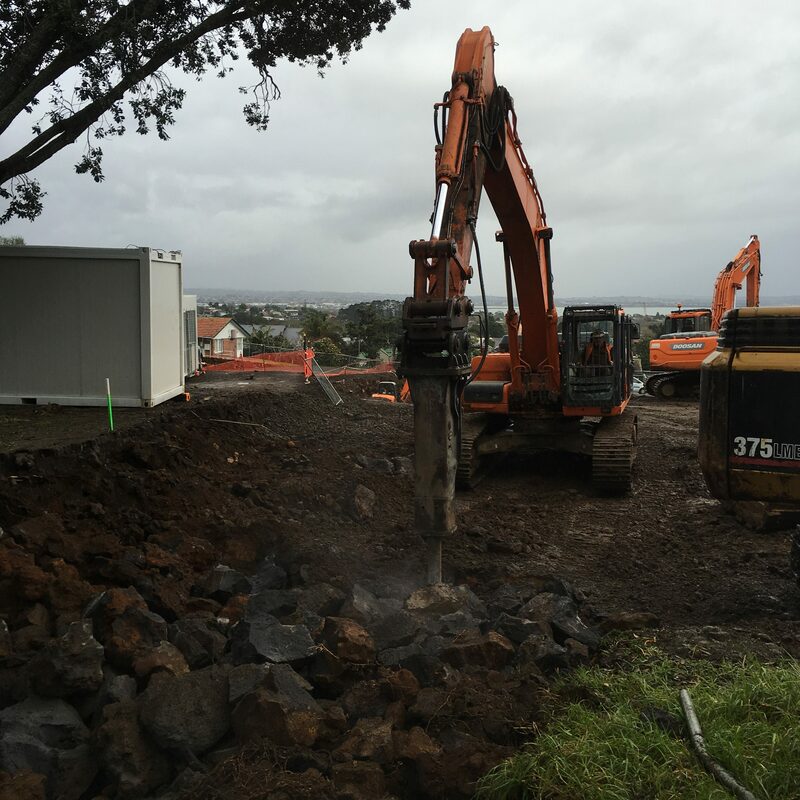 From excavation, drainage, compaction and levelling to retaining walls, rock breaking/crushing, and ground preparation of residential apartments, commercial offices and large warehouses, we get to see the Auckland regional landscape changing before our very eyes. We are very keen to hear from you so that we may assist and advise on any project large or small. We enjoy seeing bright ideas progress into city landmarks and knowing we made it happen is the best feeling. Earthtec specialise in the best earthmoving, crane, rock crushing/breaking and siteworks equipment. Earthtec Rock Breakers range from 12 to 35 tonnes with the ability to break all types of rock on any site. We tackle all rock types within the Auckland Region: basalt, blue metal, volcanic lava formations. 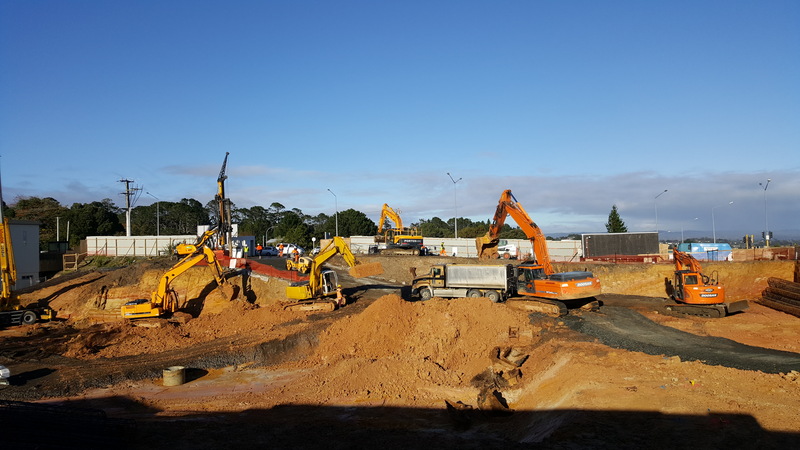 We have all the equipment to support Rock Breaking onsite with support diggers for fast load out, sump pumps to remove all underground water and of course truck transporters to remove or reuse the additional rock. Here at Earthtec we rely on our trucks to do the hard yards on every job. We have a brand new fleet of 12 steel bin Mercedes Actros V8 510hp trucks and corresponding steel bin trailers. Our trucks have been specifically designed to carry dirt, rock and other heavy duty material. 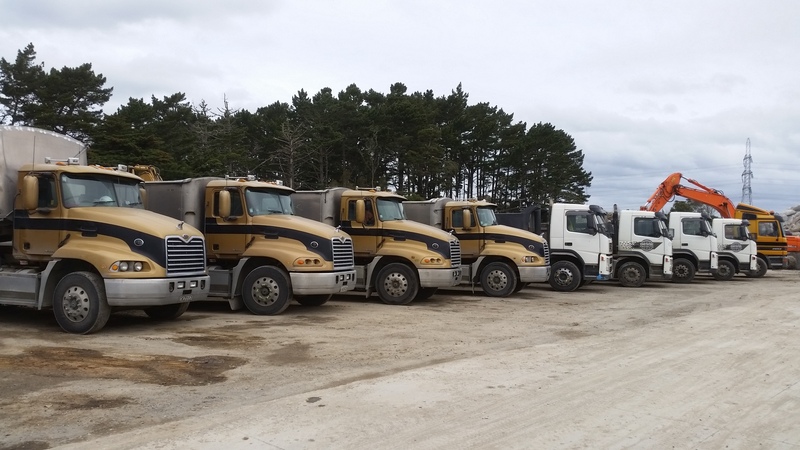 Our trucks are the number one mover of all of our equipment and materials. When it comes to transporting earth from place to place our trucks fill up to the maximum level and are fully reliable. We take pride in our trucks with sizes ranging from small to extra large we can cover everything. Earthtec Bulldozers and Excavators work well with other equipment to prepare flat surfaces and move large amounts of dirt and rock quickly and efficiently. Earthtec have access to the largest cranes for building construction purposes. Earthtec Cranes are excellent for lifting and lowering heavy materials during the erection of large apartments and office blocks. 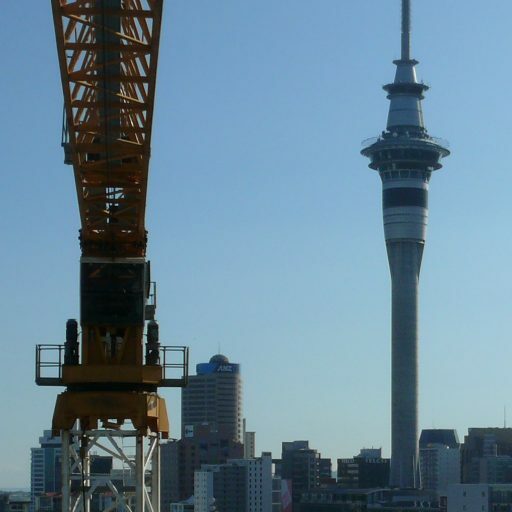 The cranes are especially useful for the Auckland region where domestic building and commercial and industrial construction are intensifying as the population steadily increases. Earthtec Compactors and Rollers allow for smooth, flat paving, asphalt, metal and tarmac surfaces to be created for commercial and industrial purposes. 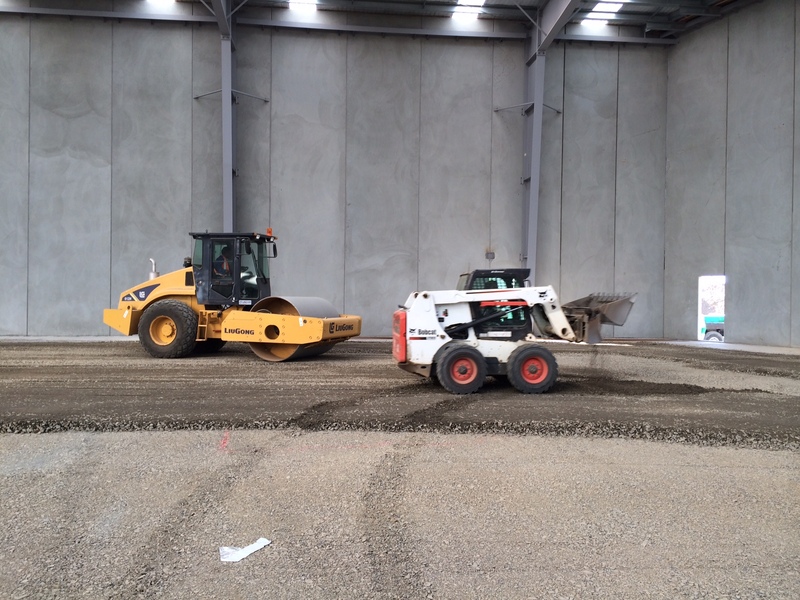 From driveways to car parks to warehouse and supermarket floors, Earthtec has all the equipment and experience to produce flawless flat surfaces. Our rollers are highly reliable earth levellers and work well in conjunction with diggers, compact excavators and bulldozers. Earthtec specialises in commercial and industrial drain laying, working to the Plumbers, Gasfitters and Drainlayers Act 1976. Water mains, public storm water and sewage are easily taken care of by the team at Earthtec. When it comes to pipes we work with Spun concrete pipes, man holes and risers, junctions and cut pipe radius specials, PVC and polyethylene plastic and Clay and Earthenware pipes. We specialise in everything from trade waste to recreational park drains to Grease, Gully, Interceptor and Silt traps. Septic tanks and biocycle package treatment plants. Earthtec Diggers are the ultimate team member and operate on all our jobs. Flexible and reliable, our diggers range between 2 and 75 tonnes. Our diggers carry many attachments from rock buckets, rakes, mulchers, drilling and compact rollers. To keep your site programmes on schedule and working smoothly our diggers are supported by timber rafts, crossing mats, wheel wash baths, equipment bins, support delivery vehicles, transportors, 4, 6 and 8 wheeler tip trucks with trailers, steam cleaners, rollers and our heavy lift mobile crane also plays a big part in the work that is achieved with our diggers. 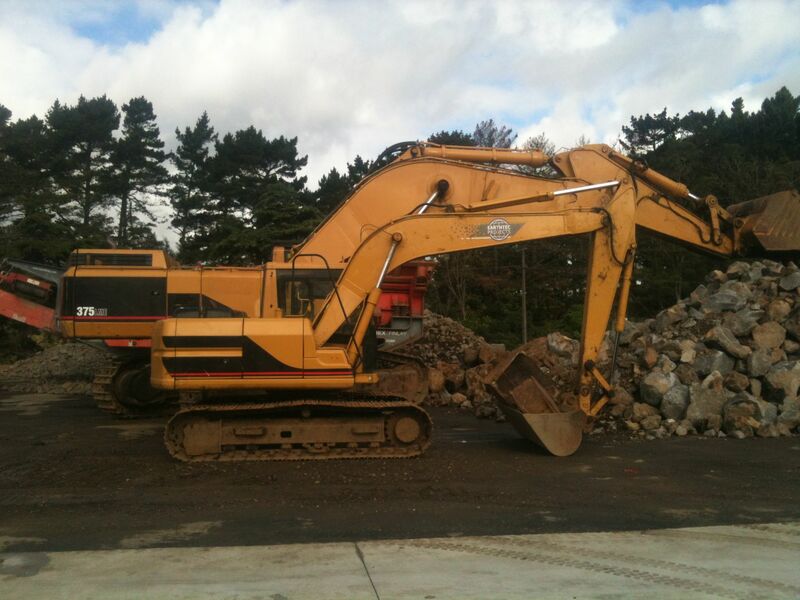 Our mobile rock crushing plant makes short work of all rocks - hard and brittle - that are found in the Auckland region. The unit can take large rocks and produce fine rocks suitable for all construction and sitework purposes. 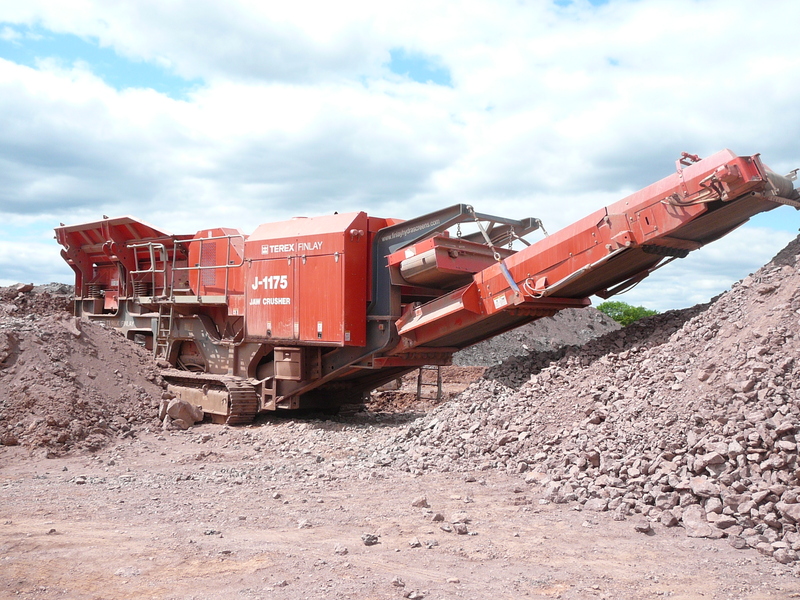 Rock Crushing is a fairly straightforward process with large rocks entering one end of the Rock Crusher and coming out much smaller and easier to transport to other locations or use onsite spreading into the landscape for building purposes.